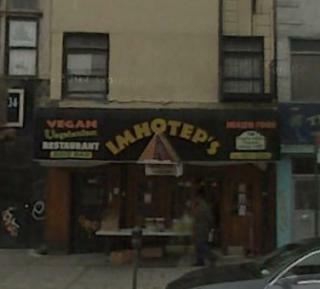 Imhotep is a local Brooklyn vegetarian food market. They serve vegan cuisine produced with organic, locally grown ingredients as well as organic juices and other organic produce. You may choose either 4 small or 5 large items from the 15 offered at the food bar. The tables are located in the back of the restaurant while the food store is in the front. Imhotep resides on 734 Nostrand Avenue, btwn. Prospect and Park place. You can call Imhotep at (718) 493-2395 or visit them by taking the 2, 3 or 5 train line. There are no alcoholic beverages served in this establishment and it is completely child friendly. You may schedule for delivery or pick-up, but there are no beforehand reservations available. The food is great for Lunch/Dinner and Credit Cards are accepted. Imhotep is open daily from 9am-10:30pm.